Purchasing and deploying business VoIP services for an organization can seem overwhelming especially if you’re upgrading from landlines for the first time. You need to know your business requirements, prepare your business VoIP network for additional traffic, make configuration changes on network equipment (routers, firewalls etc.) and maybe even train your users on the advanced features of the new system. However all the above steps turn out to be quite simple compared to the monumental decision that awaits the company – selecting the right VoIP service/vendor. This buyer’s guide familiarize you with what you need to know when purchasing hosted VoIP services. Given that VoIP services are actually pretty inexpensive compared to landlines, it can be tempting to go with the most feature packed or expensive plan available. After all it is still cheaper than what used to pay your phone carrier! On top of that, you get all these shiny new features that you never knew existed. At the opposite end of the spectrum, many businesses are constrained by budgets. It means they often end up looking for the cheapest plans that may offer only the bare-bones or basic phone service. While this may appear to be a good idea on paper, these organizations often find themselves wanting to upgrade or switch vendors pretty quickly. The best thing to do – even before you start looking for vendors – is to make a list of those features/aspects that your business absolutely needs. This list will be pretty short and address aspects like basic phone service, voicemail etc. A second list should contain all the items that you feel will improve efficiency or productivity within the company. It could be features like ACD queues, digital faxing, IVR etc. These are not must-have’s but would certainly be nice to have. Armed with these lists, you can filter vendors based on your requirements. If the service offers functionality that is not on either of your lists, make sure that you’re not being charged extra for it. This way you ensure that you are getting the most bang for your buck without wasting resources or limiting functionality. VoIPstudio makes this step quite easy by including all available features in their plans i.e. there is no artificial distinction between ‘basic’ and ‘premium’ features to choose from. Some companies seem to think that the best strategy to get customers is to offer them every available combination under the sun, so they have something for everyone. When you’re shopping for VoIP service, this can actually be counterproductive – it’s confusing, takes time to understand and in the end you’re still not sure what exactly you are getting. 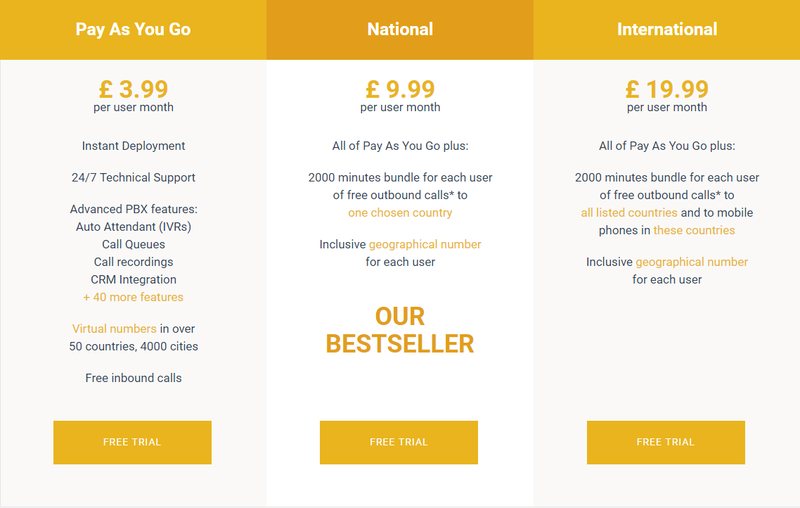 VoIP service pricing generally falls into two basic models – pay for user or pay per feature. Within each category, vendors offer pay-as-you-go or unlimited calling plans. If it takes clients hours just to understand the various options, plans and pricing terms, is the actual service going to be an easier to use? This is why VoIP studio offers three different plans and includes every single feature in all of them. Depending on call volume and business size, you simply pick a plan that is right for your company. VoIP is one of the few technologies which appears simple on the surface (especially to use) but hides a lot of complexity behind the scenes. This doesn’t mean that every VoIP service is easy to set up, use or get started with. While quite a few providers advertise easy configuration, in reality it may take them days to set up and customize the system for your company. It often means your employees are left twiddling their thumbs and business comes to a halt as you switch over to the new system. The setup process for VoIPstudio in contrast is quick and simple and doesn’t take more than a few minutes. The company offers a free 30 day trial and this doesn’t even require you to register a credit card for the account. If you are satisfied with the service, you can simply activate billing and keep using it without any extra steps. It can’t get any simpler than that! Customer and tech support are different sides of the same coin but they’re not exactly the same. Tech support is what you need when something goes wrong such as phones not working, poor voice quality, conversations getting cut off abruptly etc. When this happens, you need experienced technicians to diagnose and fix the problem as soon as possible. Customer support on the other hand is often required for general issues such as billing errors, account level problems or just to help users find their way around. What good is the most feature packed service if customers cannot even hear you? What if the service offers top-quality audio but half the calls get dropped or never connect? Along with quality and reliability, you also need to ensure that the VoIP service is secure. Since voice conversations are carried on the same network as other forms of data, VoIP is vulnerable to many of the same exploits. Reputable vendors such as VoIPstudio strive to provide the best and most reliable service. In fact, the company even offers Internet failover protection since VoIP requires Internet access. So even if your Internet fails because of some problem with the ISP, your business can still continue to receive calls through a designated number. In the end, selecting VoIP service is similar to acquiring any other technology – prioritize your requirements and then find a provider that offers everything you need at a competitive price.